Weekend Historical Happenings: 7/20/13 - 7/21/13 ~ The History Girl! The Atlantic Highlands Historical Society presents its annual Arts and Crafts Fair, at Veterans Park, First Avenue in Atlantic Highlands, NJ. Art, gifts, jewelry, toys, wood crafts, and much more! Free admission. There will be music, entertainers, games, and activities for the kids. A chance auction will be held benefitting the Atlantic Highlands Historical Society. Rain date is Sunday, July 21, 2013. For more information, visit www.atlantichighlandshistory.com. Join in a behind the barriers tour of Waln’s gristmill in Upper Freehold on Saturday. Get up close to the gears, pulleys, belts, and vast array of carefully crafted wooden parts that make this ingenious system work. You will visit areas of the mill not generally open to the public with the miller’s undivided attention for the morning. No fee, but space is limited, call 609-259-6275 to reserve your spot. Program from 10:00 am - 12:00 noon. Suitable for ages 8 and up. Come to Bivalve, Port Norris Township, NJ on Saturday for a free, fun day of games, crafts, and activities for the whole family as we explore the world of seafarers and buccaneers. There will be live music on the wharves, and food and beverages will be available from the Oyster Cracker Cafe. Celebrate life on the sea while exploring the cultural and environmental heritage of Bivalve! This event will be held from 11:00 am - 4:00 pm at the Bayshore Center at Bivalve, 2800 High Street, Bivalve, Port Norris, NJ. For more information, call 856-785-2060 or visit www.ajmeerwald.org. On Saturday, stop by the Jersey City & Harsimus Cemetery for "A Mid-Summer Night Scream!" Benefit Festival for this historic graveyard. The day will feature an entire outdoor festival of events including live music and magic! Also, meet the Bellewood Paranormal Investigative Team. Walking tours of the cemetery will be conducted throughout the day, including the mysterious underground crypts. There will be a very special tribute to the historic Cemetery's 'resident' circus owner, The Frank Robbins Circus of Jersey City. There will be food, drinks, beer, wine, arts and crafts, activities for children, vendors, and tent exhibits. Festival runs from 1:00 - 9:00 pm. Lucy the Elephant in Margate, NJ turns 132 this weekend! Join in the celebration on Saturday from 10:00 am - 8:00 pm. There will be a moon bounce, giant slide, obstacle course, dunk tank, a mechanical elephant carousel, and food including funnel cakes, cotton candy, popcorn, Philly pretzels, snow cones, and of course birthday cake! The Philadelphia Eagle cheerleaders will be on-hand from 1:00 - 3:00 pm. The Building and Grounds Committee at Historic New Bridge Landing will be having a work party on Saturday at 7:30 am to tend to the grounds. Their objective is to spread the mulch from the trees that came down during Hurricane Sandy and tackle invasive weeds on the property. No experience is needed - just bring water and gloves if you have them. They will also begin restoring a trail leading from the out-kitchen to the main walkway, which will increase traffic to this important building. Allaire Village Incorporated is hosting a summer flea market and yard sale on Saturday from 8:00 am - 3:00 pm. The event is held in the Show Field of Allaire State Park. With more than 100 vendors displaying new, used, and collectible treasures of all types, there will be something for everyone! There is a $5 parking fee for this event. Patrons of the Flea Market will wish to visit the restored 1830s iron-manufacturing community known as the Historic Village at Allaire. Noted archaeologist R. Alan Mounier will be at the Vineland Historical & Antiquarian Society on Saturday from 1:00 - 4:00 pm demonstrating the traditional Native American craft of flint knapping - a method of making arrowheads. Due to the excessive heat, the demonstration will be held in the museum's Great Room. The Vineland Historical & Antiquarian Society is located at 108 S. 7th Street, Vineland, NJ. For more information, call 856-691-1111 or visit www.vinelandhistory.org. Celebrate all things Irish and Scottish at Historic Cold Spring Village's 9th Annual Celtic Festival on Saturday and Sunday from 10:00 am - 4:30 pm. The festival features musical entertainment throughout the grounds, interactive demonstrations and a pub area with all-day live music. The opening ceremony will be held at 12:00 noon on Saturday and led by Nae Breeks Pipes & Drums Band, which is comprised of members of the famed Atlantic City Sandpipers. The Village's restored, historic buildings will also be open, with historical interpreters demonstrating the trades and crafts and the 1800s. Main stage performances include sets by Nae Breeks Pipes & Drums Band, world-renowned musician Tom Brett, South Jersey favorites Smitty's Kitchen, and local musician Mary Roth. Joe McGonigle will entertain all weekend long at the pub tent and Robert Mouland, the one-man Irish band will offer a historical look at Irish music throughout the weekend. In addition, The New Jersey Irish Setter Rescue will join the event with their lovable breed to meet with visitors. Visitors can also meet Grace O'Malley, the Pirate Queen, throughout the weekend and watch demonstrations from the New Jersey Blacksmith Association. New for 2013, the Village will host the Kiddie Highland Games with child-sized versions of the infamous tests of strength including the caber toss, shot put, and hammer throw. On Sunday, visit Historic Longstreet Farm in Holmdel to take a step back in time to watch blacksmiths perform their craft. They will be shaping iron into everyday products. Blacksmiths were as common as an auto mechanic in towns and on farms of the 1890s. The free event runs from 1:00 - 3:00 pm. Historic Longstreet Farm is located at 44 Longstreet Road, Holmdel, NJ. For more information, call 732-946-3758 or visit www.monmouthcountyparks.com. On Sunday at 2:00 pm, Roy Pedersen will present an overview of Morven Museum & Garden's landmark exhibition, "Coastal Impressions: Painters of the Jersey Shore, 1880-1940." This program will be held at Princeton University, McCosh 50. 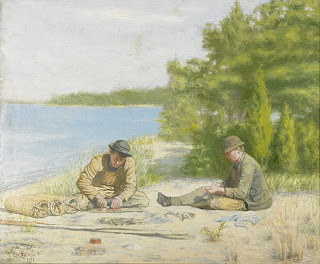 Mr. Pedersen is the leading collector and historian of this important group of painters, including Edward Boulton, Will Hicock Low, Albert Reinhart, Carrie Sanborn, Charles Freeman, Ida and Clara Stroud, Julius Gold and others, all of whom lived and worked at the New Jersey shore. By examining the role of these artists in the history of American art, Mr. Pedersen establishes a rich chapter in the cultural heritage of New Jersey. According to Pedersen, "The impressionists of the New Jersey shore were passionate, thoughtful artists who created organizations and exhibitions to present their ideas. Their achievements which for too long were ignored deserve to be seen within the body of American art of the late nineteenth and early twentieth centuries." This event is free and open to the public. Reservations are not required and seating is limited. For more information, call 609-924-8144 x 113 or visit www.morven.org. On Sunday, Macculloch Hall Historical Museum is delighted once again to present Japanese Drums and Ikebana Art. The garden's magnificent wisteria inspires this program bringing together the Japanese style drumming known as Taiko, performed by Kenny Chin and the beautiful Japanese art form of Ichiyo Ikebana, with Anna Nakada, for an engaging performance of music and living art in spectacular surroundings. On Sunday, there will be an exhibit of nature photography and song by Karen Stevenson. Karen will dazzle you with her great photography and cheer you with her music in the keeping room of the Foster-Armstrong House. At the Nelden-Roberts Stonehouse on Route 206, the Minisink Garden Club will conduct tours of the traditional herb garden they maintain. For more information, visit www.montaguehistory.org. Tewksbury Township's highly anticipated bi-annual Barn Tour will be held on Sunday from 10:00 am - 4:00 pm. Co-sponsored by the Tewksbury Historical Society and the Tewksbury Trail Association, the event attracts visitors from near and far as it showcases some of the township's most unique barns, both old and new. There are six barns on the tour this year offering a diverse display of country life in Tewksbury. Some of the barns have horses, some are old, and some are new. Tickets, while they last, may be purchased the day of the tour. The cost is $20.00 per person; $5.00 for children 12 & under.